Camera Slideshow installation, capabilities, features and options. Note: This documentation applies to Version 2.7 and above only. Download the CameraSlideshow_UNZIP.zip file from the email you have received after purchasing the extension or from the Store website. UNZIP the file CameraSlideshow_UNZIP.zip. You will find a ReadMe.txt file and installation file (mod_camera3.x_vX.X.zip). Choose the option Upload Package File and select mod_camera3.x_vX.X.zip. 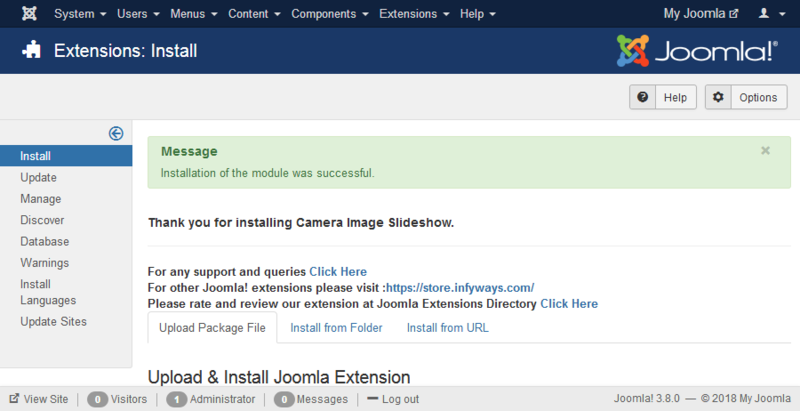 After successful installation of the module, go to Extension > Modules and Search for Camera Slideshow. If you don't find it in the modules page then click on the New button in the top left corner of the page and add Camera Slideshow Module. After opening or adding a New instance of the Camera Slideshow module you can find different tabs with different parameters to set. In general settings tab you can set the dimension, slideshow effects and other navigation settings. Slideshow Width : Set the width of the slideshow in pixels or percentage. For example you can set 100% or 1200px. Slideshow Height : Like the width you can set the height parameter pixels or percentage. If the width is set in percentage then use the height also in percentage. The loader of the slideshow appears on the slides. The loader can be completely customized using the following parameters. Loader Type : Set the loader type to None, Pie or Bar. Loader Opacity : Set the opacity of the loader. The range is 0.1 to 0.9. Loader Color : Select the loader color using the color picker to match your template. Loader Background Color : Select the background color of the loader. Loader Padding: Padding around the loader can be set. Loader Position : Set the position of the loader on the slide. Camera Slideshow has more than 30 animation and easing effect. Stop Slideshow : Set it to ON if you want the slideshow on stop on a particular slide. Stop Slide on : Set the slide number in which you would like to stop the slideshow. Ex: 3, the slideshow if set to Auto Slide will automatically stop on slide number 3. Image Animation Effect : Choose the effect you would like the images to appear. Easing Effect : Easing adds more visual effects to the slideshow. Image Alignment : Set the position of the slideshow images inside the slide. 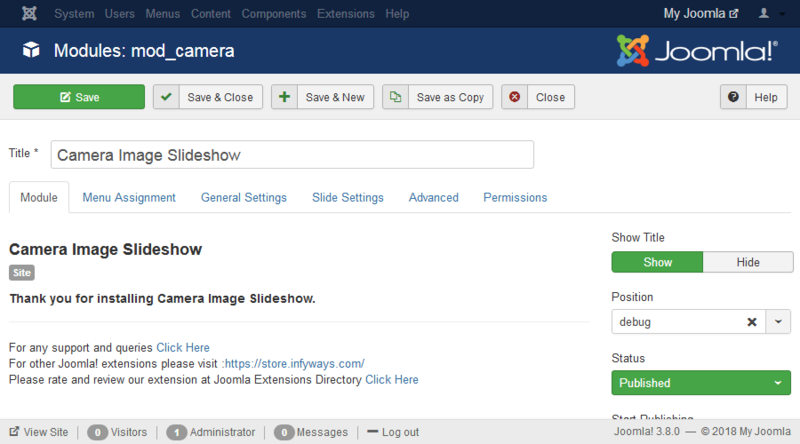 Auto Advance : Set to ON if you would like the slideshow to change automatically. Pause on Mouseover: Set to ON if you want to pause the slideshow on hovering the slide. Pause on Click : Set to ON if you want to pause the slideshow on clicking the slide. Navigation Buttons on Hover : The Navigation Buttons/ Arrows appear when you hover on the slide. Set it to OFF if you don't want the navigation. Slideshow Overlayer : Select whether to put a layer on the images to prevent the users grab images simply by clicking the right button of their mouse. Pagination Type : Choose the pagination type for the slideshow. Ex : None, Buttons, Buttons with Images, Image Pagination. Thumbnail Image Width/Height : If the pagination type is set to Button with Images or Image Pagination then you have to set the width and height of the image thumb. Ex : 110. Time : It defines the milliseconds between the end of the sliding effect and the start of the next one. Transition Period : Length of the sliding effect in milliseconds. Navigation Skin : Select the navigation color skin from a list of 15+ skins to match your template. Navigation Button : Option to show or hide the slideshow navigation. Set ON to hide. The slideshow has option to control few features for mobile devices. Auto Advance : Set to ON if you would like the slideshow to change automatically for mobile devices. Navigation Buttons On Hover : The Navigation Buttons/ Arrows appear when you hover on the slide. Set it to OFF if you don't want the navigation for mobile devices. In Slide Settings you can either fetch images from folder or add images individually into the module and set the caption and link the slideshow to an URL. 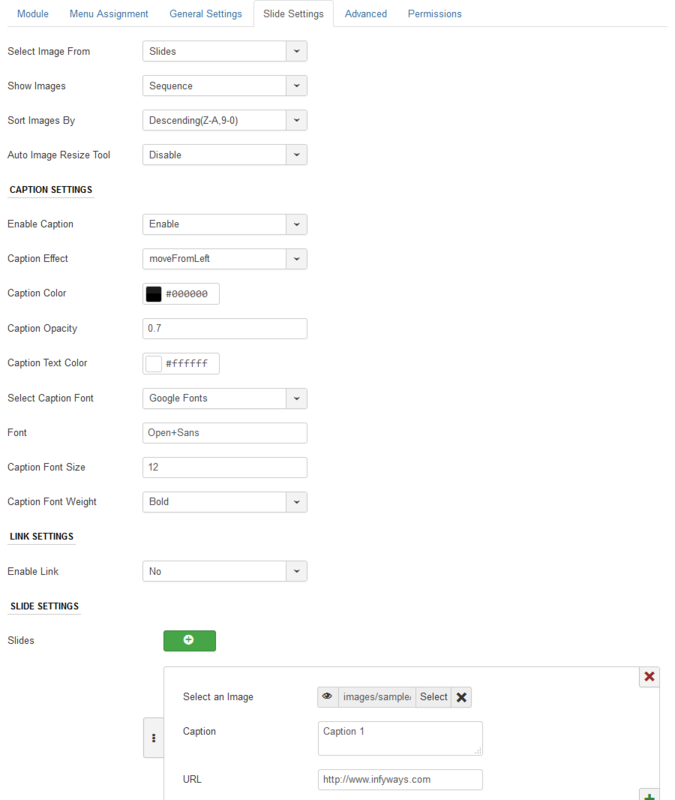 Select Images From : Option to fetch images from folder or set each slide in the module. Show Images : Option to show the slideshow of the images in sequential or randomly. Sort Images By : Sorting of slideshow images can be done ascending or descending order of the filename. 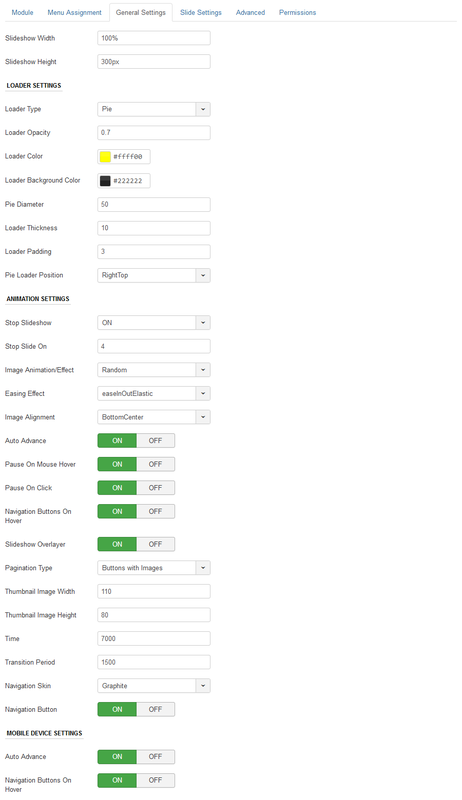 Auto Resize Tool : We recommend to use only when the images uploaded into the media manager are not of the desired size. Resize Image By : If the resize tool is set to enabled, you can find this parameter which can help you resize the images by height, width or both. Set the values to 900 or 1000 without using px or percentage in the Image Height and Image Width parameters. Enable Caption : Option to enable or disable the caption which appears on the slideshow. Enable Caption : Select the effect of the appearance of the caption on the slide. Caption Background Color : Select the color of the caption background using the color picker. Caption Text Color : Select the caption color using the color picker. Caption Font : You can use your own font, Google Fonts or the template default font. Caption Font Weight : Set the caption font thickness to Normal or Bold. Enable Link : Set it to Disable if you don't want to link the slides. Open In : You can set the links to open in same or new tab. To add a new slide, click on the + button. For each slide you have to fill 3 different parameters. Select an Image : Select the image from the media manager. Caption : Add Caption to the slideshow. You can add HTML tags into it. You can add/remove/edit multiple number of slides.